Azad, also known as Ravan, was addressing Bhim Army activists who staged a dharna in front of the Muzaffarnagar collectorate in Uttar Pradesh. MUZAFFARNAGAR: Bhim Army chief Chandrashekhar Azad said Saturday he would start a countrywide agitation against "atrocities" on Dalits and demanded the withdrawal of cases against the community during an agitation early this year. The Dalit leader alleged that the Bharatiya Janata Party-led state government was taking action against innocent Dalits and false cases had been registered against members of the community during a Bharat Bandh on April 2. Some Dalit groups called the bandh in protest against a Supreme Court judgement in March that ruled out immediate arrests in cases under the Scheduled Castes and Tribes (Prevention of Atrocities) Act. Twelve people were killed in violence during the bandh. Azad demanded withdrawal of the cases registered during the Dalit agitation and asked for compensation to the families of the deceased who were killed in police-firing. 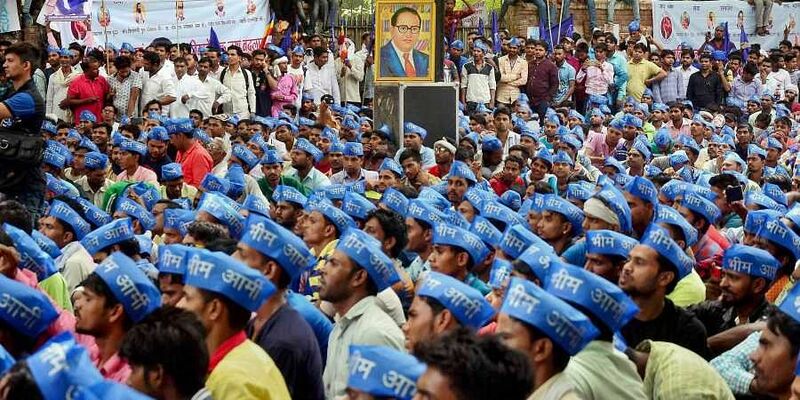 The Bhim Army chief announced that his organisation would start a nationwide agitation against atrocities on Dalits and said they began their agitation from Muzaffarnagar on Saturday. The Dalit leader also hit out at the district authorities for not allowing their meeting here.